G connectivity is a feature typical of flagship smartphones. The latest Lumia device, however breaks this myth, the new 625 is Lumia’s biggest handset with 4G and a low price tag. Nokia’s latest handset features a 4.7-inch display, which makes this phone the largest of all Lumia devices out there. The big display and 72mm width requires a rather big grip for one-hand use. Nokia’s designers have compensated the extended dimensions with a slim profile at 0.36 inches. The one-piece polycarbonate shell carries Lumia’s distinctive bright and vivid color. It wraps the whole device up all the way to the one-piece Gorilla Glass 2 on the front. On top there is a grip-friendly matte surface, which unfortunately doesn’t guarantee fingerprint resistance. Although it features an integrated design the back panel of the 625 can be easily removed. Yes, 2013 was marked by the emergence of many smartphones, tablets and hybrids with fullHD displays. The 625 offers plenty of display surface, which unfortunately falls victim of its more pocket-friendly nature. The 4.7-inch IPS screen here offers only 800×480 pixel resolution, which results in the disturbing pixel density of 201 ppi. Pixelation is easily noticeable and the display falls to deliver the sharpness in the details. It just didn’t feel right for Lumia’s biggest handset to fail to deliver a high-definition picture. If it could be any comfort at all, it still super sensitive so it will understand your commands even through the gloves. Camera is another feature which gives out the phone’s more affordable price tag. On the back of the 625 there is a 5MP camera, which compared to the 8MP standard in Lumia’s devices is just low. The Carl Zeiss lens on the back delivers an average photo quality, typical of mid-rangers. The front camera offers 0.3MP. Both cameras struggle to collect enough light in low-light, which results in noisy output images as the sensor inside is not back-illuminated. At least a modest flash comes to help in this case. The smartphone provides a pretty limited internal storage – only 8GB which is large enough only for the basic applications. You will probably need to get a micro SD card to store your multimedia files. You can provide up to 64GB more on a memory card. After we had already figured that this phone is by no chance the best that Nokia can offer, we did not have high expectations for its performance and productivity. However, this budget Lumia device did pretty well. It is powered by a dual-core Qualcomm Snapdragon S4 processor at 1.2GHz frequency and 512MB of system memory. It slides the menus and loads the pages swiftly with a pinch of lag here and there. Although the Lumia 625 is more on the budget side it works with 4G networks which makes it one of the best budget suggestions to work with the super-fast network. There is a 2000mAh battery piece inside which provides juice for around 15 hours of talking on 3G. 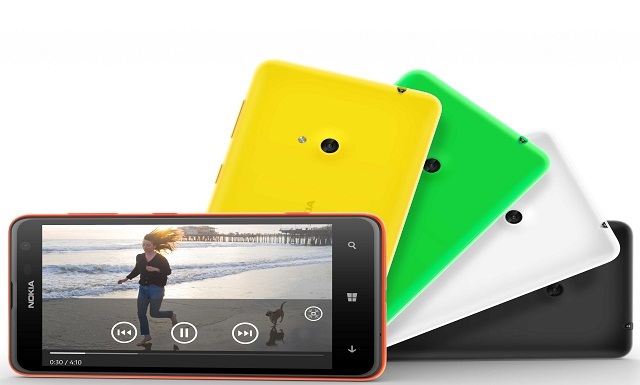 Lumia 625 comes in a variety of colors – black, white, orange, green and yellow.